Director John Madden has a made a name for himself with syrupy romantic dramas (Shakespeare In Love, Captain Corelli's Mandolin, the Exotic Marigold movies) but he deviates from the formula here. Just like in his 2010 thriller The Debt (also starring Chastain), gone are the gorgeous visuals and romantic trysts in favour of hard, biting dialogue with first time writer Jonathan Perera's script leaning on the Aaron Sorkin walk-and-talk, the cold cynicism of House of Cards and the behind-the-scenes dark arts of Michael Clayton. This is a protest song with gun control and the Second Amendment in its sights, leaving no room for gender politics. 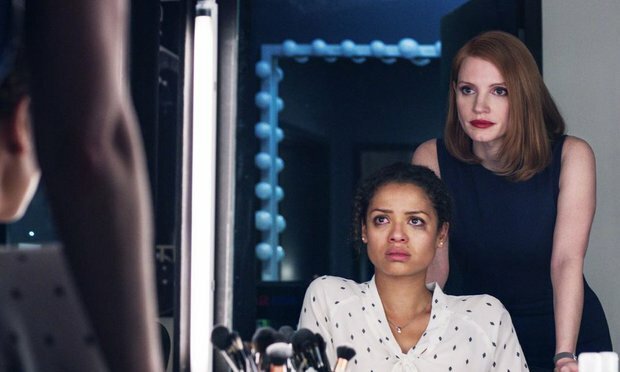 That Sloane/Chastain is in a job/role traditionally reserved for men is avoided bar two brief moments: an underling comments that Sloane pees standing up (he admits to peeing sitting down), and when Christine Baranski accuses her that a woman in her position has done "jackshit for feminism," Sloane coolly responds that "gender doesn’t interest her." Great, one might think, let's get to know this person. But we never do. This is Chastain's first real headliner since Zero Dark Thirty and while she gives it socks there's not a whole lot for her to work with. Perera's script is certainly pointed in it political stance (the system is rotten) but despite raising opportunities to get under her skin character nuance is found wanting. Against her doctor's wishes, who believes she's killing herself with the hours she puts in, Sloane pops pills to keep her pep, but when it's put to her in a hearing (with John Lithgow's senator) that this affects her judgement it's frustratingly not further explored. When she uncharacteristically succumbs to a teary moment and a gigolo-with-a-heart (Jack Lacy) attempts to comfort her she physically pushes him away. "Were you ever normal?" she’s asked at one point but she, nor the film, is interested in finding out the answer. Sloane has one defining characteristic - she wants to win – but with nothing else going on with her it leaves a large hole in the movie.